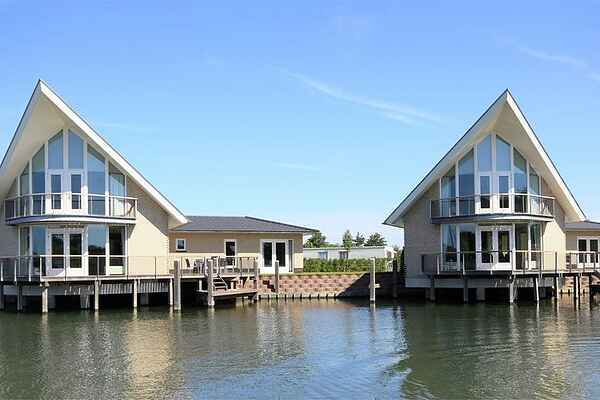 The detached water villas on Waterpark Veerse Meer are of high quality in many aspects. For example: the location directly on the water, the large window in the living room for a fantastic panorama, the finish of the villas and the daring design. You can choose from various types. Of the standard variant there is a 6 person (NL-4341-02) and an 8 pers. (NL-4341-05) version. Of the luxury type, which has a sauna, you can choose a 6 person (NL-4341-03) villa. Each combination not only has a dock for various types of boat, but also a garden with garden furniture.